Little York High School "Eagles"
The village of Little York (population 269) is located on Il. Route 135 approximately 10 miles north of U.S. Route 34. The nearest town of note is Monmouth which is about 8 miles to the southeast of Little York. The Cedar Creek runs to the north of town and Davids Creek to the south. Little York is located in northwestern Warren County. "I have a copy of the Little York Sesquicentennial bulletin that was put together for 150 years. Little York started in 1836 and the Sesquicentennial was held in 1984 (August 18-24). It has quite a bit about the Schools. 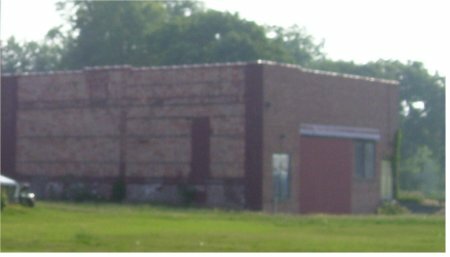 The picture of the brick building reflects information about the school in present day. The original building is just North of the existing high school building which has been refurbished into apartments. The stonework still shows the school name. Here is the text of the information. It must have been shortly after that, possibly in 1903 or 1904, that the first brick school building was built in Little York. It is presumed that it housed both the elementary and the high school from its beginning for various sources agree that Little York High School opened in 1904 as a two-year high school and became a three-year school in 1905. "This photo shows the original part of the Little York Grade & High School. this picture is from around 1909. The building was doubled in size a few years later. The gym was added around 1932, the new part, which is the section in the picture Mike Edwards sent you was built around 1956. This school was last used in the 1978-79 school year. At that time it held 2-4 grade classes." In an article written by Carol Clark and printed in the Daily Review Atlas, May 30, 1979, it is said that it became a four-year school in 1906, and continued the four year program until 1921 when it reverted to a three-year high school. 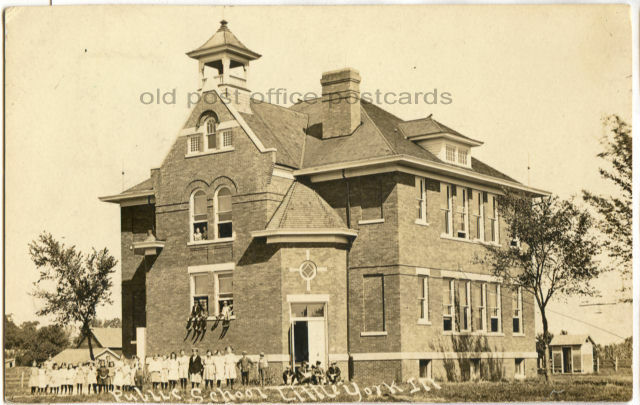 According to David Pardee, as reported in an article by Ralph Eckley for the same newspaper, in 1915 Little York had eight grades of elementary school and four years of high school, all of which were located in one four-room building. The high school occupied one room, and J.K. Neumann was principal for the entire school, as well as the only teacher in the high school. 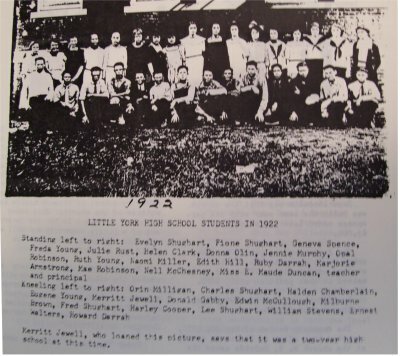 The picture of the student body of 1915 shows twenty-six high school students and the principal. Another article written by Ralph Eckley for the June 2, 1983, issue of the Review Atlas, Lavona Adams Steepleton is quote as saying that when she started to Little York High School in the fall of 1923 it was only a two-year high school but by the time she was a junior it had been expanded to a three-year school. During the times when there was only a three-year high school it was not uncommon for some of the students to go to Monmouth High School for their last year, staying in Monmouth boarding houses during the week. About 1927 the first addition was made to the school. If the original school was only four classrooms, the addition must have doubled the space or possibly tripled it. The second addition was a gymnasium which was built in the 1930s. One source says in 1932 while another states it was built about 1938. This gym was used by students in both schools. 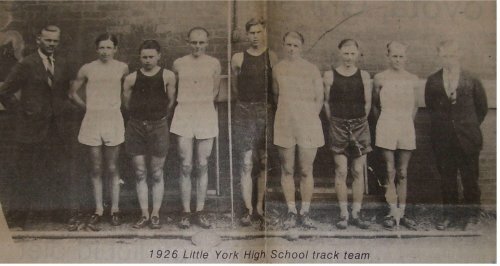 In the fall of 1938 Little York Community High School became a four-year institution. From that time until the new high school was built, the high school was on the second floor with the exception of the science classes which were taught on one room on the first floor. When the high school added home economics and agriculture courses, these classes were held in the basement of the building. In 1941 and 1942 the Little York Community High School was built at a cost of $75,000. General contractors for the new construction were Jorgenson and Son of Clinton, Iowa. 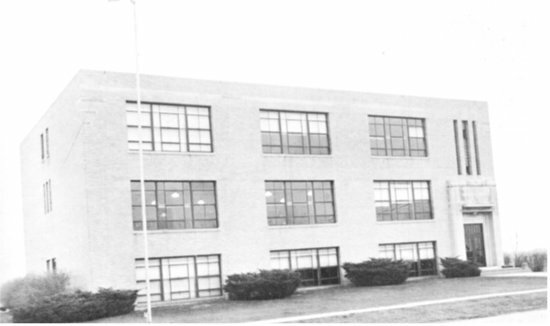 The move to the new high school building was made in February of 1942. The second semester of the 1941-9142 school year, the high school had a six-day week. By that time the United States was in the Second World War and there was a man-shortage so the male students were needed to work in the fields. The last day of school that year was May 2. The building formerly occupied by both the elementary and high school classes became the Little York Elementary School. 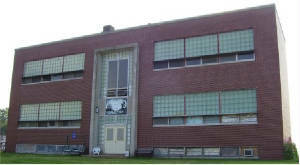 The gymnasium attached to the elementary school continued to be used by both schools although they were in two different school districts governed by two school boards. The next major change was the addition to the elementary school in 1956 when classrooms were added to the front of the old building. These seperate elementary and high school districts continued to operate until 1960 when the Yorkwood School District was formed. This was the combination of the Little York and Kirkwood schools. During the first years of the new district which encompassed grades K-12, the kindergarten through sixth grade grade went to the respective elementary buildings. 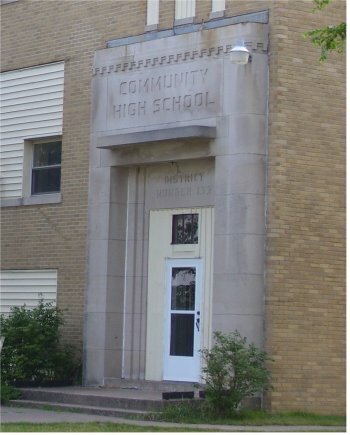 Grades seven, eight, and nine went to the Kirkwood High School, while grades ten through twelve attended classes in the Little York High School building. The Little York baseball field is used by the Junior Sheriffs League presently. I don't know if it was used by Little York High school but I am sure it was. The Pavilion that sits on the Northwest corner of the field is called "Tapole's Pad". It was named after my father whose real name is Richard S. Edwards but everyone in three counties knew him as "Tadpole". He was a board member for Warren County for several years." The former high school in Little York still stands and is in use today as an apartment building. The building served as Yorkwood High School for grades 10 - 12 from 1960 through 1969. It then served the school district as a grade school from 1970 through 1979 when a new school building was built. Recent consolidation talks have been kicked around. It was decided that Yorkwood High School would be closed at the conclusion of the 2006-07 school year. Students of Little York and Kirkwood will now attend high school as part of the Alexis United School District. Little York High School for sure offered boy's basketball. Football was offered for a time too. The boys also competed in track and baseball. We are always searching for more when it comes to the accomplishments of schools on the Glory Days site. If you have any further information you can share regarding the Little York High School athletic porgram, or any other aspect of Little York High School, please contact us via the means listed at the bottom of this page. The Little York boys had a nice run in the middle 1950s. 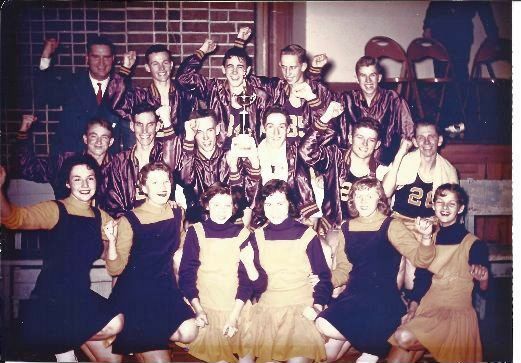 The boys of the 1955-56 team won a District and Regional title. The 1956-57 team brought home a District title. Information is being sought as to the overall records and coaches names of the more successful Little York teams. We are hopeful someone will assist us. The two seasons shown on the IHSA web site are listed below. Several basketball scores involving Little York High School participating in the IHSA State Tournament were located on a site titled "Illinois High School Basketball Scores." These results are printed below. GALESBURG (102): Lind 28, Graning 20, Owens 18, Young 10, Odell 8, Williams 8, Junkins 6, Douglas 4. LITTLE YORK (64): Ca. Goff 30, Cl. Goff 13, Stokes 8, Damewood 6, Gullinger 5, Boock 2. "The 1955-1956 Little York High School basketball team was one of the finest small town teams in my memory in western Illinois. They were big, strong, experienced and very tough to beat. In IHSA play, they were defeated eventually by Galesburg, I believe, in the sectional finals at Moline. The starting players were: Carl Goff, Clyde Goff, Ancil Guilinger, Dwight Boock, and Bill Damewood. I am not certain of their records in '56 & '57, but they were very good. Carl Goff went on to a great college career at Monmouth College." 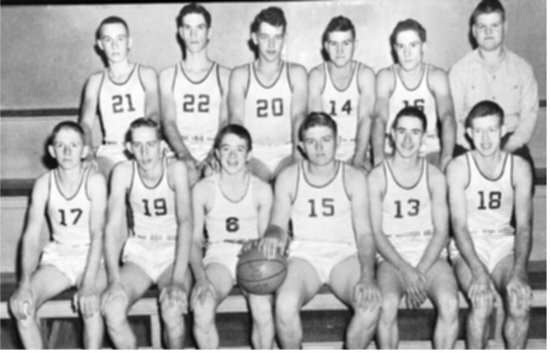 "The 1955-56 Little York Eagles were led by Carl Goff, a terrific shooting guard. IHSA basketball was all one class back then and we had about 85 kids in the high school, but faced Galesburg in the sectionals. John Thiel was coaching Galesburg and they were a Western Illinois power . The Silver Streaks were edged out in the super-sectionals by Rockford West, in overtime, and they went on to win back to back state titles. I believe we had 64 points in our loss to Galesburg, but Carl had 30 of our 64 total, proving he could score against the best. Carl averaged about 23 points per game and would have easily been the scoring leader for all of West Central Illinois, but weather cancelled two of our games , and he finished 23 points behind Ken Anderson of Moline. And of course there were no three pointers back then, and an awful lot of Carl’s points came from what would have been three point range." **Final basketball game for the Little York HS Eagles. Merged with Kirkwood HS in the summer of 1960 to form Yorkwood High School. David Armstrong tells us the Little York High School football field was located across the street from the school building. It continues to be used today as a baseball field. The football field was used until the consolidation took place withwith Kirkwood. The research of Tom Sikorski brought us the following Little York football records. Last win in school history was 26-0 over Keithsburg. 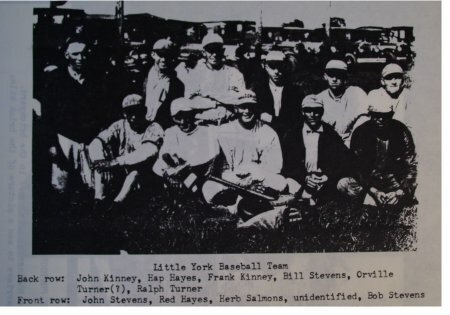 We know that Little York High competed in baseball. If you have any information on these teams please drop us a line. The Little York Eagles competed in track and field. left to right: Eddie Johnson - coach, Curtis Anderson, Wendell Brown, Ralph Steepleton, Robert Young, Clifford Armstrong, Russell Darrah, Gerlad Smith and, Charles Greeley - a teacher. Little York had a great activities program as well, evident in an IHSA District championship in Debate in 1958 and 1959. "I attended and graduated LYCHS in 1957 and was fortunate to be on the football team of 1956 , and we were conference champions, However our record was not 5 & 5 but 6 & 0, and we were the only undefeated football team in school history. We played 8 man football and had previously played 6 man , but never 11 man . I believe our basketball team of 1955-56 had a 27 & 2 record and did indeed lose to Galesburg back in the days of one-class basketball." The following article was written ver batum from a newspaper article from 1983. It was submitted by Mike Edwards. The photo accompanying the photo is posted above. The article is by Ralph Eckley of the Monmouth Review-Atlas. Mike could not recall the date but guesses it was written in 1983. The picture was loaned from Ralph Steepleton of Little York for publication in the newspaper. "More than 40 years ago I wrote a series of stories about the villages in Mercer, Henderson and Warren counties, and a 1942 story told of the Little York High School. Early in February, the story told, pupils of the Little York Community High School were to move into a new $75,000 building, located at the south edge of the village. The general contractor, Jorgenson and Son, expected to finish up the building about Feb. 1. Opening of the high school marked a new high in the 105 years of educational history (up to then) in Little York. The first school in Sumner township, in which the village of Little York is located, was opened in 1834 at Denny and was taught by Betty Hopper. Peter Terpening taught the first school at Little York in 1837. For many years the Little York High School and grade school had occupied the same building (to the North), but with the opening of the new high school, the crowded condition was relieved. The Little York High School was opened as a two-year school in 1904, and became a three-year school in 1905. Pupils had to go elsewhere for their fourth year and in "my day" as a high school student, from 1915 to 1919, many came to Monmouth to graduate. The story said that the old grade school building, erected around the turn of the century, had an addition added 15 years before and five years before a gymnasium was added. it was to be used by both schools. Then , some years ago, the high school was located on Ill. Rte 135, south of Little York, as part of the Yorkwood Community School District, serving Kirkwood and Little York. The elementary schools continued for some years in the two villages, but now they are in the new elementary building adjacent to the high school. 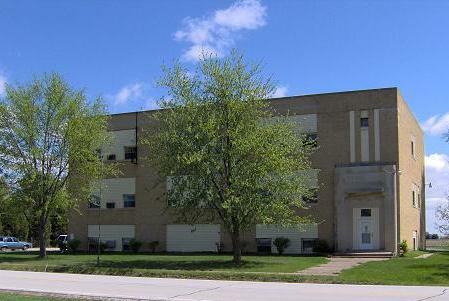 The former Little York High School, erected 41 years ago, was sold and has been converted to apartments. The building was sold by the school district to Tom Sims, local banker, who converted the building into apartments."